I always dreamed about participating in the Olympic Games. This wasn’t possible as a swimmer because I stopped very early, at age 16, and I retired as a triathlete long before the sport joined the Olympics. Because sports have always been part of my personal and professional life, the dream to participate would never die. Right after Rio de Janeiro was announced as the host city for the 2016 Games, I sought out the paths to fit in as a professional for its organization. Unsuccessful at the time, I didn’t give up. I interacted with friends who worked with head hunters and my friend and professional swimmer, world medalist and gold medalist at the 1984 Los Angeles Games, Ricardo Prado. 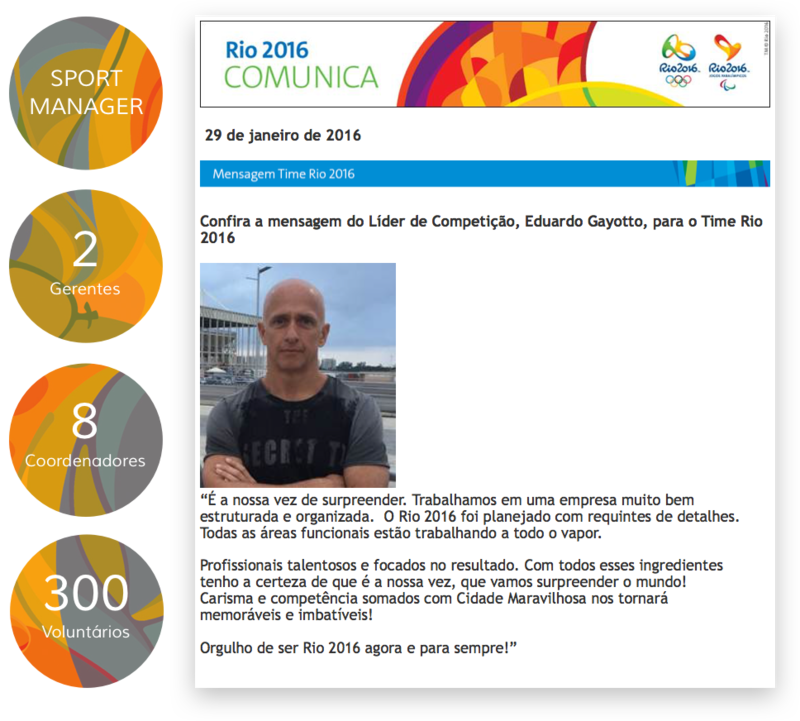 Prado had already worked during Pan 2007 and helped organize the Rio 2016 Games. At the end of 2014, Prado published on his Facebook page that he was opening a selection process to fill the position of Swimming Sport Manager. At that time, he was responsible for the six aquatic sports (swimming, water polo, high diving, synchronized swimming, aquatic marathon and Paralympic swimming). I decided to join the selection process and four months later, I joined the Rio 2016 Olympic Games Organizing Committee. The building where I began to work was built from containers in the Cidade Nova neighborhood, located in downtown Rio de Janeiro. Attractive, well-decorated and well-organized, it already demonstrated the high standard required by the Olympic Games. I received a great deal of material, including the committee’s organizational chart. Extensive and complete, I could see that several functional areas were included and better understand the grandiosity of the structure. At that moment, it became clear that the planning completed years earlier would guarantee the quality of the delivery. For me, it also became clear that a close, good-quality relationship with all functional areas would be essential for ensuring a positive swimming result. An important aspect of my experience as Sport Manager was the relationship with the Internacional Olympic Committee (IOC) and Federacion Internacionale de Natacion (FINA). These were the two secular entities we had to report to constantly. IOC and FINA consisted of highly experienced and demanding professionals. Gilbert Felli, former Supervisor of IOC, was responsible for reporting and finding solutions for the “issues” (a term widely used to indicate problems that mostly always had simple solutions) that appeared constantly. FINA was represented by its Executive Director Cornel Marculesco, a well-known professional recognized for having raised international swimming to the level of the top three most viewed sports during the Olympic Games. The relationship with both entities was excellent, except for when the subject was construction work. The Swiss, who were cordial and used to meeting previously established delivery deadlines got stressed, but remained elegant. Due to several changes to the facilities initially designed for aquatic sports (this is a very long story…), FINA ended up having to accept holding three of its sports – Water Polo, High Diving and Synchronized Swimming – at a single facility. This had never happened before, so the stress surrounding this topic was quite high, primarily because the contingency plans would be few and far between. On the other hand, the legacy we left reveals that it is indeed possible and the costs are much lower. I formed and prepared my team for the Games. I brought in Karen Casalini as Service Manager and Cezar Bolzan as Technical Operation Manager, and both started eight months before the Games. Both helped me set up the team of coordinators, which included: Lucy Gracindo (Administrative Coordinator), Gabriela Carvalho (Referee Coordinator), Gabriela Drummond (International Federation Coordinator), André Schultz (Athlete Services Coordinator), Moacyr Freitas (Equipment Coordinator), Rogério Carneiro and André Santos (Athlete Communication Coordinators), Cristiano Marcelino (Training Facility Coordinator) and Rogério Romano (Competition Field Coordinator). They all began 50 days before the Games. This team was responsible for leading over 300 volunteers, all carefully chosen. On July 24, 2016, we opened up the Olympic Park swimming pools to the athletes. As was to be expected, all the countries with high numbers of athletes arrived to reserve their spaces in the warm-up pool. On the topic of a space for the different countries, this was an item that was highly praised by several of them and by FINA as the largest space made available to teams of all times. The athletes began to arrive, and the numbers grew every day. Japan surprised everyone and appeared with the entire team to hold a very large press conference that kept us on our toes and doubled our attention. Afterward, they went to São Paulo to train and returned two days before the start of the competitions. The U.S. team, which consisted of 51 swimmers – including their big star Michael Phelps –, arrived three days before. Nine hundred and six athletes were there to swim – a record number at an Olympic Games competition. Olympic swimming could not have gone better. I would even throw out there that it was the most thrilling of all times. Several world and Olympic records were broken without the use of special suits. American Katie Ledecky became the new global swimming sensation. And most importantly, there was the farewell – of the highest level – for the greatest swimmer of all times, Michael Phelps, who won no fewer than six Olympic medals. For the whole organizing committee and myself, what was most important was for FINA and IOC to recognize our quest for excellence and that the final result could not have been better. “I’m very happy!” This was the statement made by Cornel Marculesco, Executive Director of FINA, during the competitions.